Through a chance meeting, Harry Lyon of Paris Hill became the navigator on the 1928 flight of the Southern Cross, the first trans-Pacific flight. His skill as a navigator, despite his lack of experience, was a key factor on the flight's success. Following his historic flight across the Atlantic in May 1927, aviator Charles Lindbergh commenced a tour across America, greeted by cheering crowds at every stop. He was a day late for his speaking engagement in Portland, due to foggy conditions. 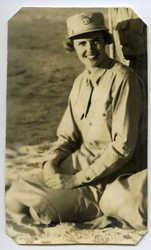 Elise Fellows White wrote in her diary about seeing Lindbergh and his plane. Two couples, a parade from downtown Caribou to the airfield, and two airplane flights were the scene in 1930 when the couples each took off in a single-engine plane to tie the knot high over Aroostook County.